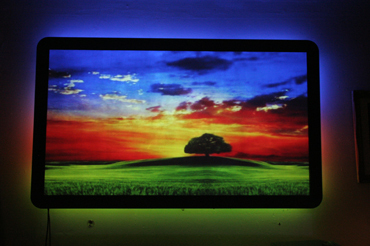 Our colour halo screen was inspired by the Philips Ambilight system. which we liked as a concept but found disappointing with its limited and small scale application. So we set about building a larger version for use with a custom projection screen, for a significantly larger and scalable version. 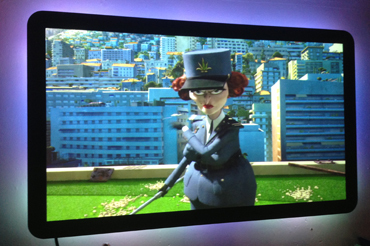 160 RGB LEDs around the perimeter of the screen create the colour halo screen's outside glow effect, replicating the colour at the edge of the picture being watched. If the left side of the image is green; the LEDs on that side of the screen glow green also. It is particularly effective with vibrant cinematography and animated films. The projection screen to see here is 1.8m wide by 1.1m high but we can build them to any size and specification, with or without a border, with a backlit corporate logo, and so on. We used out custom projection paint on the front of this, which is a secret formula developed by us for front projection screens - it has to be seen for real to be truly appreciated.